If you're the kind of fan (read: dub hater) who looks for anime by putting something like this in Google search -- " One Piece episode 1 SUBS SUBS SUBS" -- then you've probably heard a few characters, especially Luffy, yell out "Sugee!" (the informal version of sugoi) a couple of times. It's kinda Luffy's thing; sort of like Naruto's catchphrase "dattebayo". The difference is that sugoi is actually a common expression. 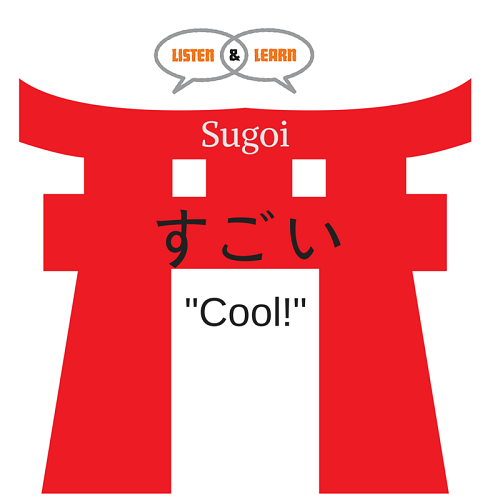 The word "sugoi" (すごい) can be translated as "great" or "amazing." You'll generally hear it being used as an exclamatory expression, like when a character sees or experiences something that's, well, great or amazing. Many times, characters will just say "sugoi" on its own. 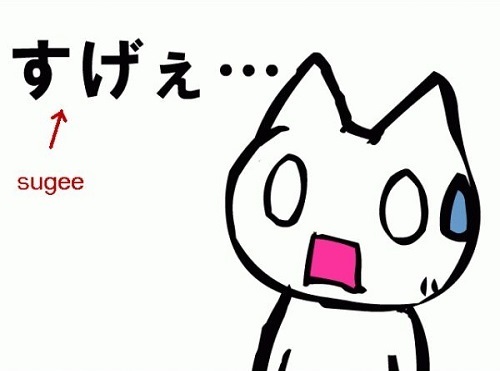 But it also appears in various phrases like "Sugoi ne!’ (すごいね) which means "That’s so great/amazing!" There's also a very informal version of sugoi -- sugee (すけぇ). It's an expression normally used by men. But young women have also been known to go this less formal route as well. There are essentially four ways sugoi can be used in Japanese. We'll give an example for each. This is the generalized translation. As mentioned above, when a character exclaims "Sugoi!" or includes it in a declarative sentence, they're generally trying to express that something is great or amazing. 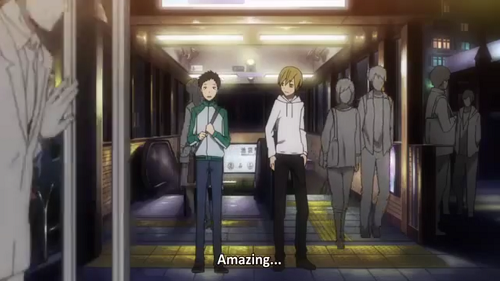 In the first episode of Durarara! !, Mikado Ryuugamine moves to Ikebukuro at the behest of his friend Masaomi Kida. Mikado, never have been to Tokyo before, is highly impressed when he gets off the subway and sees the city for the first time. All he can do is stand there as he takes it all in and say, "Amazing," before finding the words to continue: "This world I've only seen on the internet and in comics is finally right in front of me." 2 - Damn, you strong! While sugoi is a way of conveying how cool something is, you’ll find that characters usually say it in reaction to something specific. It's rarely uttered about everything and anything under the sun. Luffy abuses this word (and sugee) perpetually. He's always impressed by his enemies and can't help but yell it out in some way (which usually involves his eyes transforming into stars and his jaw opening incredibly wide). One of the first times Luffy expresses himself this way is when he meets Usopp in episode 9. At that point in the anime, Luffy and his crew had just arrived at the Syrup Village in search of a proper ship. Usopp, a resident of the village, tries to scare them off by taking an impressive stance on top of a rock and boasting about how great it is. During his monologue, Usopp says, "If you're thinking of attacking this village, then forget it. My 80 million subordinates won't sit by quietly!" which is responded by cries of acknowledgement from these supposed 80 million subordinates. 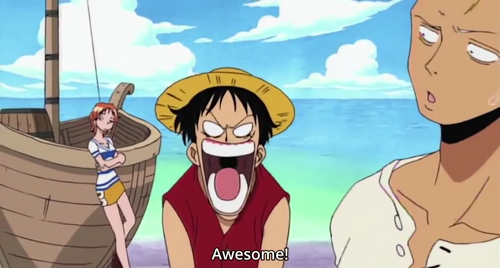 Rather than being terrified, Luffy can't help but be impressed by Usopp's greatness and his vast number of subordinates, yelling (and drawing out the word) "Aaaaaaaawesome!" Interestingly enough, sugoi isn’t always a positive reaction. When taken in a particular context, someone could actually be conveying a sense of dread. It’s kind of (emphasis on kind of) similar to saying something sarcastically in English like “Oh, that’s great,” when the “that” is only “great” for making the speaker's life miserable. Or there's nothing great about it. It's just plain awful. 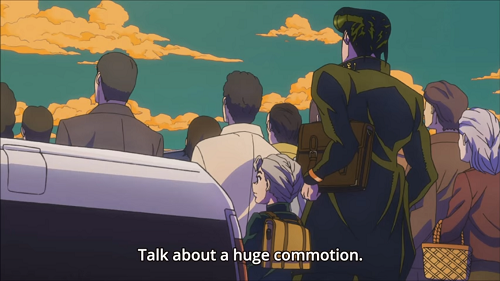 In the first episode of JoJo no Kimyou na Bouken: Diamond wa Kudakenai, there's a moment right before the crap hits the fan when Kouichi Hirose and Jousuke Higashikata accidentally get caught up in a convenience store robbery. Kouichi obviously doesn't like the look of the numerous police cars and the large number of people standing around. So he expresses his discomfort by saying "Sugoi," before commenting on the huge commotion. To Kouichi, there's nothing "great" or "awesome" about the large crowd or the huge commotion. 4 - So this ... Very that ... Really this and that. Sugoi can actually become an adverb. In this form, sugoi embellishes the word proceeding it and translates as "really," "very" or "so." When this happens, the "i" in sugoi is normally switched out with “ku” to make sugoku (すごく). Since kawaii (かはいい) is such a popular word, we'll use it as a quick example. If you put "sugoku" before "kawakii," depending on the rest of the sentence, the combination could mean "so cute," really cute" or "very cute": すごく かはいい. Sugoku isn't just sugoi as an adverb. It's also an informal version of totemo (とても). You can actually get more informal than sugoku, too. Rather than changing sugoi to sugoku, you can just keep sugoi and use it as an adverb. Even though it’s grammatically incorrect, it’s used commonly in colloquial conversation. In this anime example, we're going to change it up a little. We've found a scene that uses the word sugoku (sugoi as an adverb) as a "negative" connotation, where it expresses dread rather than something positive. So rather than something being "really awesome" it's going to be "really bad." This example surprisingly comes from the first episode of K-On!. Leading up to this scene, the members of the Light Music Club have already tried convincing Yui Hirasawa to join their club numerous times. 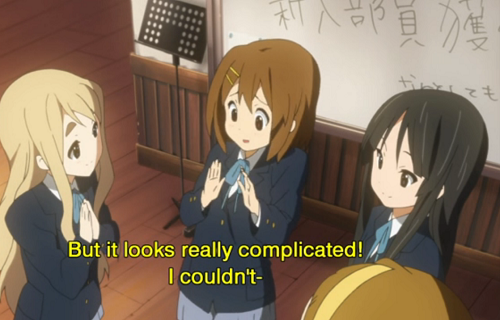 At one point, they suggest for her to start playing the guitar, to which Yui says "But it looks very complicated." In this case, the fact that sugoku (すごく) is put in front of the word "difficulty" (muzukashii), it becomes "very difficult/complicated." Subarashii is more of a “neutral” way of saying how great something is because it doesn’t have any contextual variations like sugoi. However, the language is a little stronger than “great,” translating to “wonderful,” “stunning,” “marvelous,” etc. 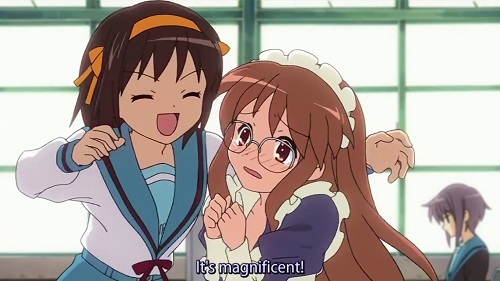 During episode 3 of Suzumiya Haruhi no Yuuutsu, Haruhi Suzumiya struggles to dress Mikuru Asahina as a maid. As Haruhi tries to make Mikuru sexier, she talks in great detail about how certain parts of Mikuru's body will be accentuated by becoming more scantily clad, before exclaiming "It's marvelous!" or "Sore wa subarashii" (それは素晴らしい). In episode 5 of Nichijou, Yuuko Aioi finds out that her teacher, Izumi Sakurai, included pictures on a past quiz because it would make the test easier. Since Izumi isn't a greater artist, Yuuko volunteers to draw something for the next quiz. 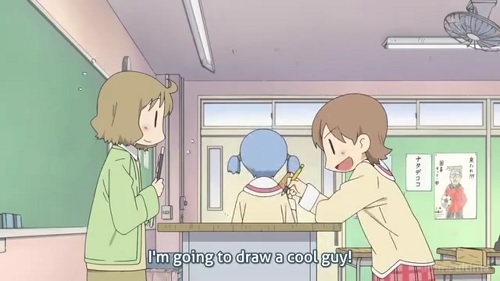 It doesn't take long for Yuuko to decide that she wants to draw a "cool guy." Since she's talking about a "man" who's "cool-looking," she uses the word "kakkoii" instead of "sugoi." Later on in the same scene, when Yuuko continues to talk about the "cool guy" she's drawn (whose name is George Samidare), Izumi exclaims how "cool" it is, sticking with the word kakkoii the entire time, not sugoi.